Bexley is an upscale Columbus suburb with roots tied to Capital University founded by Lincoln Goodale in the mid 19th Century. Urbanization in the area began around 1876 when Capital University moved from its original location near Goodale Park to its present location. Professors and their families soon began moving east, building homes and enroll their children in Pleasant Ridge School. But it would take a war to give Bexley the bump it needed to become a community with all the amenities. This community of professors and teachers remained unchanged for the 20 years or so until the start of the Spanish-American War in 1898 when the area became a part of military history. An area around Broad Street and Drexel, known as Bullit Park, was chosen by Governor Bushnell as an assembly site for 15,000 Ohio Volunteers headed for Cuba and the Spanish-American War. It was Camp Bushnell, 500 acres of ideally located land that was quickly transformed into a military camp. With the camp also cam sewage lines, water lines, lighting, tents and commissary supplies. As fast as the soldiers arrived, they were processed and housed. So efficient was the setup that army officers who dealt with the facilities gave it high marks on all levels. The improvements made to the area for the camp, remained after the troops left for Georgia and then on to Cuba. These improvements made the area a prime location for real estate development. Improved turn-of-the-century trolley and car travel made it possible to still work in Columbus, yet live further out from the hustle, bustle and general congestion associated with the large metro center at the turn of the Century. The improved transportation greatly increased the number of people interested in living east of Alum Creek in what would later become the Village of Bexley. The area north of Town Street, now Bryden Road, was virtually undeveloped before 1905. In that year, however, a small group of prominent Columbus families began a movement to develop this area as an exclusive residential community. Led by Robert H. Jeffrey, who had been mayor of Columbus, along with other prominent citizens such as E.N. Huggins and Colonel Lincoln Kilbourne, they began building mansions in the area. The community around Capital University flourished and grew. In January 1907, a civic association called the Pleasant Ridge Improvement Association was formed. It's goal was to promote public improvements that would attract additional families to buy land and build in the area. Roads, sidewalks,and street lights were installed. Trees were planted and yards became landscapes. These early residents and their civic association are credited with instituting the rigid building restrictions that are now a familiar part of the Bexley community. These restrictions improved the area making it one of the more beautiful and well-kept communities in Central Ohio. The village would include all land between Livingston Avenue and Town Street, but excluded a smaller community further north called Jeffrey. Jeffrey was too small to be incorporated, so their civic leaders started talks with the Pleasant Ridge Association. That summer, both groups met on the terrace of the Jeffrey Mansion and agreed to join forces. At this meeting, at the suggestion of Col. Kilbourne, the name "Bexley" was chosen for the soon-to-be village. That name came from the parish housing the Kilbourne family estate in Kent, England. With a population around 1,000, Frank Holtzman was elected the first mayor, and the first ordinances passed reflected the times they were enacted: residents were banned from letting their cattle graze on village property. Public intoxication was also prohibited as was being able to discharge your firearm within the village limits. Bexley reached the required 5,000 residents necessary to become a city in 1928, but could not be certified until after the 1930 national census was official. The village formally became the City of Bexley in January 1932. 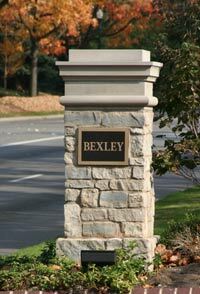 Today, Bexley has a population of over 13,000 in an area that encompasses about 2 1/2 square miles.